Rob graduated from UWE Bristol with a BA (Hons) in Illustration. Using traditional materials such as pen and ink, pencil and sometimes paint, his work swings between humourous/satirical images, and the more dark and sinister. He describes his latest work as having a macabre quality. Over the years Rob has been inspired/influenced by lots of different artists; comic artists such as Robert Crumb, Daniel Clowes and Adrian Tomine, some artists who do ‘retro’ type illustrations like Josh Agle and Derek Yaniger, and well-known illustrators e.g. Ronald Searle, plus plenty of others. 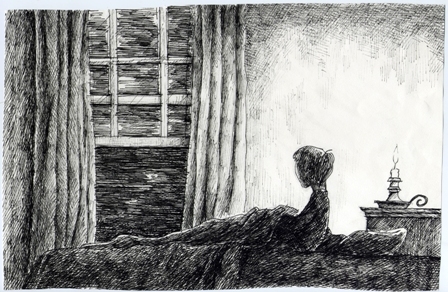 For this most recent work, the most likely parallel interms of overall style would be the drawings of Edward Gorey.